The perfect addition to that new Wishbone front end or just the job if you are running a big motor! 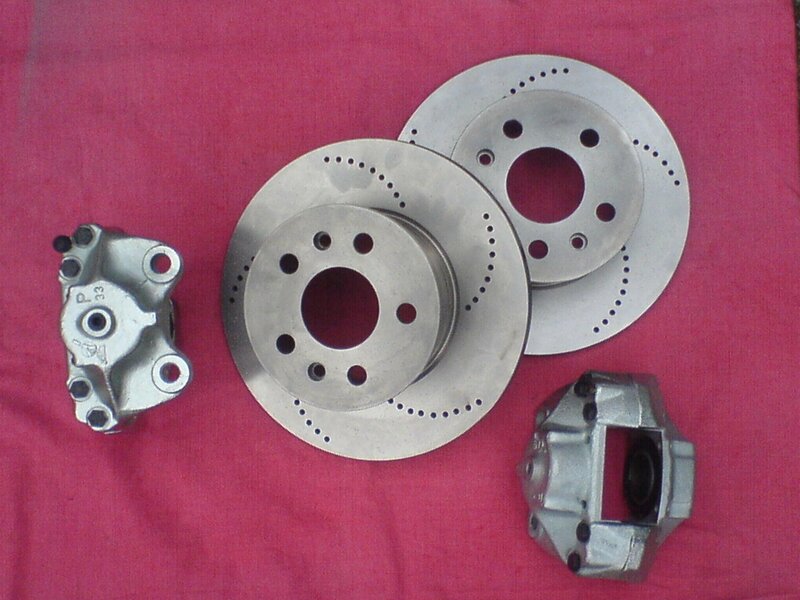 We have, once again, developed a cost effective upgrade for your brakes. The kit is made to complement our Wishbone Front Kit and therefore mounts directly to the late Bay (73 onwards) spindles. Using a clever mix of production parts and some cheeky modifications we can provide a 280mm vented disc brake coupled with tried and tested Hi-Spec 4 Pot callipers to give an improvement of over 60% compared to the Stock set up. The high strength and light weight callipers are road spec with sealed pistons for long life, while the vented disc gives much better cooling for less fade. We can also provide both 5x112 and 5x205 options. Neither of which increases the track. Porsche fitment available too. Please note 15" Wheels are required to clear this brake kit. early steel wheels are not suitable (14" or 15"). They do not have the clearance on the inside of the rim due the large step there. Each kit includes a pair of our own hub/disc assemblies, 1 pair of 4 pot callipers, 1 pair of calliper mounting brackets, wheel bearings, seals and mounting bolts. This kit uses the standard Late Bay Window Brake parts and is the ideal addition to finish off your Twin Wishbone Kit. Note discs are solid not vented as shown. Kit includes Hubs, Discs, Calipers, Bearings, Seals and all bolts required to fit. Please note 14" Bay Steel Wheels will clear this brake kit. early steel wheels are not suitable (14" or 15"). They do not have the clearance on the inside of the rim due the large step there.